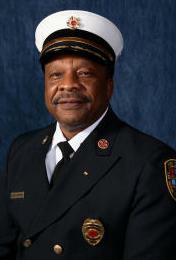 Ann Arbor Fire Chief Samuel Hopkins is retiring at the end of next week, city officials told AnnArbor.com today. City Administrator Roger Fraser sent City Council members an e-mail today announcing that Hopkins has conveyed his intent to retire effective Sept. 19. "Sam has expressed his firm desire that he be able to leave quietly, with no parties, coffees or other celebrations," Fraser said. "We are honoring that." Hopkins spent 30-plus years with Lansing's fire department before retiring as chief there in the mid-1990s. He came out of retirement to join Ann Arbor's fire department. "He came to us several years ago and has been an excellent leader of our fire services, while also setting the stage with neighboring fire jurisdictions for future collaborations," Fraser wrote in his e-mail today. "He and the Ypsi city fire chief worked out the currently successful functional fire service arrangement between our two cities that should serve as a model for future discussions with the neighboring townships." AnnArbor.com was not able to reach Hopkins for comment today. His secretary said he was out of the office until next week. Hopkins' retirement comes at a time when much pressure is being put on the fire department to change the way it does business and reduce costs. One proposal on the table calls for laying off 14 firefighters in next year's budget. "There's no question we continue to be under a substantial crunch and we're doing everything we can to deal with that in a positive way," Fraser said. Fraser has advised City Council it would be appropriate to appoint an interim fire chief sometime in the next two weeks. He said the city will take a look at its options for permanently filling the position after that. Fraser said he doesn't think budget pressures are a reason Hopkins decided to retire. He said it was a planned retirement. "Sam has actually submitted his retirement papers several times in the last year and a half," Fraser said. "He's been under increasing pressure from his family to resume his retirement. He's 67 years old. We had generally agreed he would leave sometime this fall, so it's not a surprise. We knew this was coming." Before Hopkins was hired, the city of Ann Arbor had forced out its last three fire chiefs during a five-year period. Hopkins, who had served as Lansing's fire chief from 1987 to 1994, was brought on with the expectation that he would help end years of turmoil within the department, and city officials say he has. Councilman Leigh Greden, D-3rd Ward, said he thinks the relationship between the fire department and the city's leadership has been positive under Hopkins' watch. He said Hopkins and the firefighters union have worked constructively with the city's leadership as the department has been reorganized and downsized over the last decade. "Chief Hopkins was extremely dedicated to the firefighters who worked for him, and he was committed to pursuing regional opportunities, which is the wave of the future," Greden said. "We were grateful to have him leave retirement to join us, and I completely understand his desire to return to retirement." Ryan Stanton covers government for AnnArbor.com. Reach him at ryanstanton@annarbor.com or 734-623-2529.